The endangered Toto tribals, tea garden workers and erstwhile enclave dwellers turned up in large numbers as voting continued beyond the 6 p.m. deadline in two northern West Bengal Lok Sabha seats on Thursday amid reports of sporadic violence, EVM glitches and allegations of electoral malpractices. 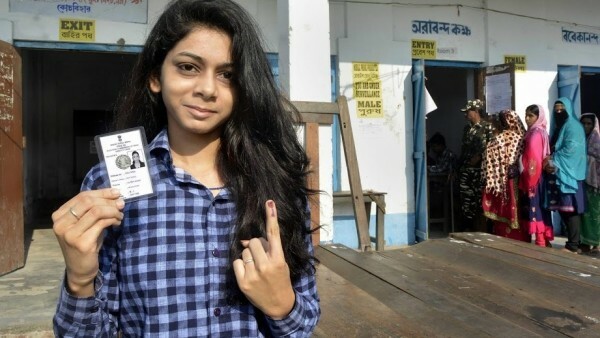 As per the latest figures given by the Election Commission, of the over 34 lakh voters in Cooch Behar and Alipurduar constituencies, an average of 80.85 per cent cast their vote till 5 p.m. While the polling percentage for Alipurduar was 81.58 per cent, Cooch Behar recorded a turnout of 80.11 per cent, an Election Commission official said. Even as BJP’s Cooch Behar candidate Nisith Pramanik sat on a ‘dharna’ (sit-in) demanding repoll in all the booths not manned by the central paramilitary forces, lots of voters waited patiently outside the polling stations, even two hours after the scheduled close. Members of the Toto tribe, which live in isolation in the small enclave of Totopara in Madarihat of Alipurduar district, came out in large numbers to exercise their rights. Around 1,600 Totos are registered as voters. Enthusiasm also brimmed over in the 51 erstwhile Bangladeshi enclaves in Cooch Behar, which saw a large turnout at the polling booths. The dwellers were voting for the first time to elect the government at the centre. Braving the heat, about 12,000 voters from the erstwhile enclaves queued up since morning to cast their vote though they aired their grievances. With organised tea garden workers and their dependents forming a sizeable chunk of the voters in Cooch Behar and about 50 per cent of the electorate in Alipurduar, there were scenes of celebration in the gardens, as the pluckers of the two leaves and a bud spontaneously took part in the democratic process since early morning. In Kolkata, state Chief Electoral Officer Aariz Arif said polling was “peaceful” save a “few skirmishes”. A police case has been initiated against five accused persons after a complaint of car vandalism in a polling station in Cooch Behar’s Mathabhanga was registered. An incident of EVM and VVPAT damage was also reported at a polling station in Dinhata. The voting process in a number of polling stations in Cooch Behar was temporarily disrupted after EVMs stopped functioning. Trinamool Congress district chief and North Bengal Affairs Minister Rabindranath Ghosh alleged a conspiracy. Bulk of the allegations and incidents of violence were reported from Cooch Behar, particularly under the Dinhata Assembly segment. Trinamool and BJP workers clashed at Dinhata’s Rosmonda Primary School booth, following allegations that the Trinamool workers were beating up and driving away the voters. In Mathabahnaga, alleged Trinamool-backed miscreants heckled Forward Bloc candidate Gobinda Roy and smashed the windshield of his vehicle after he arrived at the booth following allegations of false voting. On the other hand, the BJP’s Pramanik demanded a repoll in all the booths which were not manned by the central forces and accused the Trinamool of “rigging” 350 polling stations. Delegation of Left parties, the Congress and the Bharatiya Janata Party approached the Election Commission late Thursday with complaints of violence and demanded a repoll. “We demand that wherever the poll was conducted with state armed police in Cooch Behar, there should be a repoll. There were as many as 170 booths where there were disturbances,” Forward Bloc’s state committee Secretary Naren Chatterjee told reporters. Congress Rajya Sabha member Pradip Bhattacharya complained that in nearly 10 polling booths of Coochbehar’s Dinhata, the party’s polling agents were not allowed to enter. “For peaceful elections in West Bengal all booths should be manned by central forces,” he said. A BJP delegation led by its state Vice President Jay Prakash Majumdar sought repolling in a large number of polling stations. Of the over 34 lakh voters in these constituencies, an average 69.94 per cent had polled till 3 p.m.
A total of 34,54,274 voters, including 16,81,051 women and 29 registered in the ‘other’ category, are eligible to exercise their franchise across 3,844 polling stations to decide the fate of 18 candidates. Polls to West Bengal’s remaining 40 seats will be held in all the stages of the Lok Sabha polls – on April 18, April 23, April 29, May 6, May 12 and May 19. Votes will be counted on May 23.